LO4D.com: "NewzCrawler is a rss, usenet, web news reader, podcast receiver and blog client." CNet.com: "Of all the commercial RSS newsreaders we've reviewed, none beats NewzCrawler for its breadth of features, ease of use, and intuitive interface." About.com: "NewzCrawler is a fantastic RSS feed reader with a highly useable interface and tons of useful features and gimmicks." 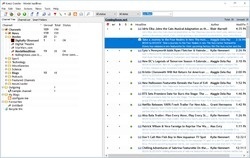 NewzCrawler will connect to specified news sources and process the RSS/feed data and display them in a list view, a news balloon or a news ticker. The main advantage of NewzCrawler is the fact it can retrieve news very quickly and updates them regularly. The views are customizable. NewzCrawler is available now from LO4D.com, a site with a library of software downloads. Use MS Agent characters for speech synthesis. Copyright © 2001-2010 by ADC Software.